The ICD guides the Concept Refinement and Technology Maturation & Risk Reduction (TD) Phase of the Defense Acquisition System and supports Analysis of Alternatives (AoA) and the Milestone A decision. Once approved, the ICD is not updated. The ICD defines the gap in terms of the functional area; the relevant range of military operations; desired effects; time and DOTMLPF; and policy implications and constraints. The outcome of an ICD could be one or more DOTMLPF Change Recommendations (DCRs) or Capability Development Documents (CDD). 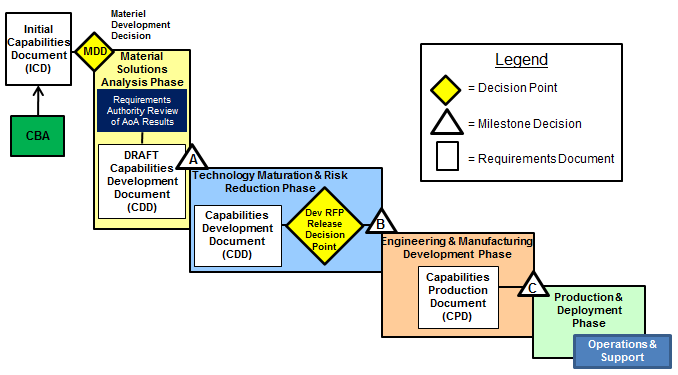 The Capability Development Tracking and Management (CDTM) tool is provided as a means to generate and submit ICDs, Capabilities Development Documents (CDD), Capability Production Documents (CPD), and Joint DOTMLPF-P Change Recommendation to the Knowledge Management/Decision Support (KM/DS) system. REGULATORY: The ICD is required for the Material Development Decision (MDD). Key Performance Parameters (KPP) are not included in the ICD. The Knowledge Management/Decision Support (KM/DS) Tool is found on the SIPRNET privileges. It is not accessible from non-secure sites.